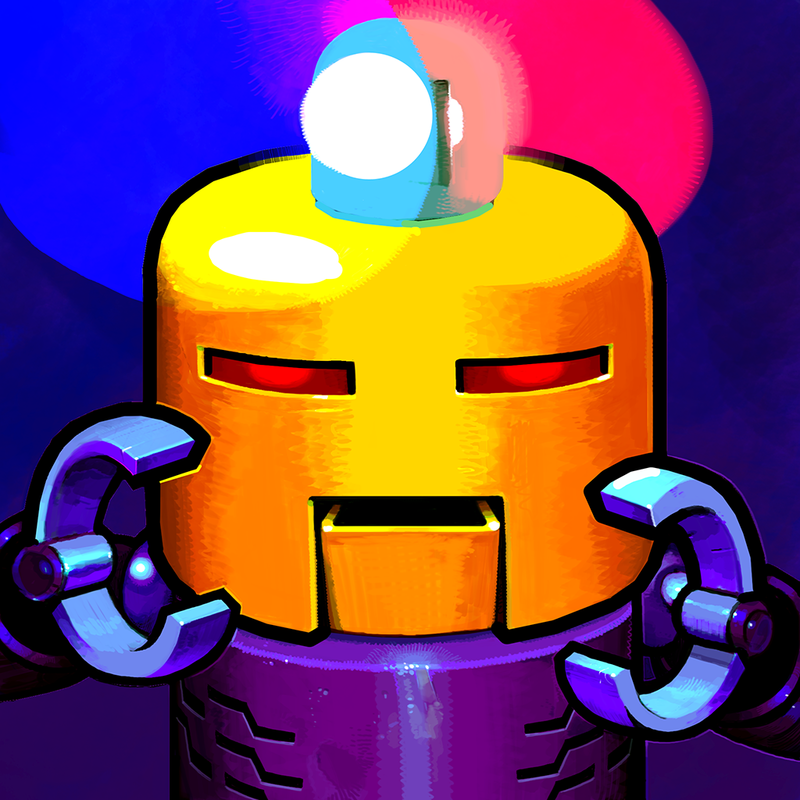 Gunbrick ($2.99) by Nitrome is a fantastic new puzzle platformer that is worth a spot in everyone’s iOS game collection. If you have a knack for retro games that will make you think, then Gunbrick will be right up your alley. 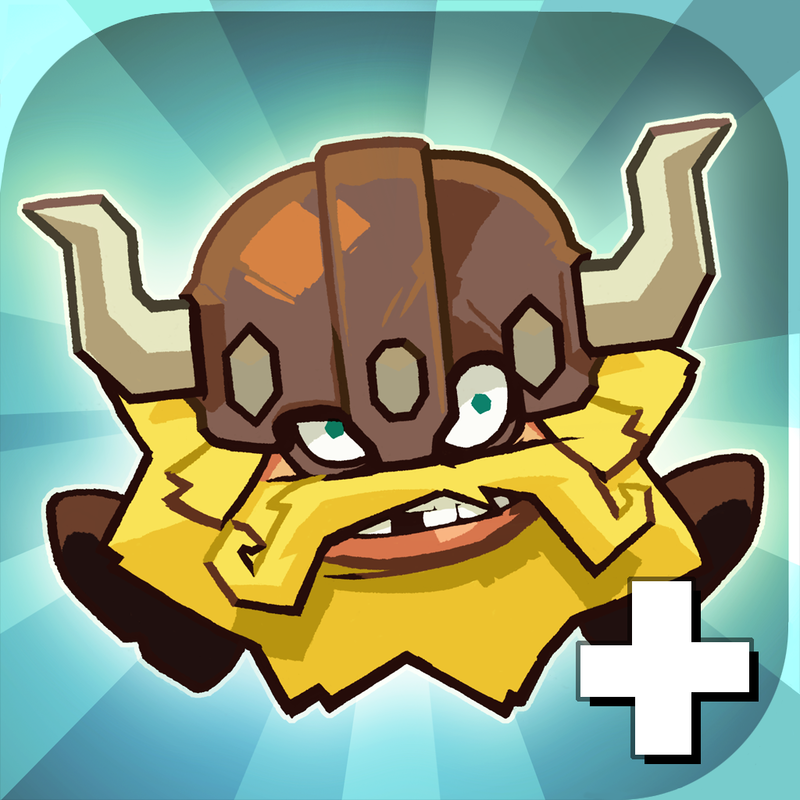 It’s from the same developers of Platform Panic and Icebreaker: A Viking Voyage, which are also fantastic games in their own right. 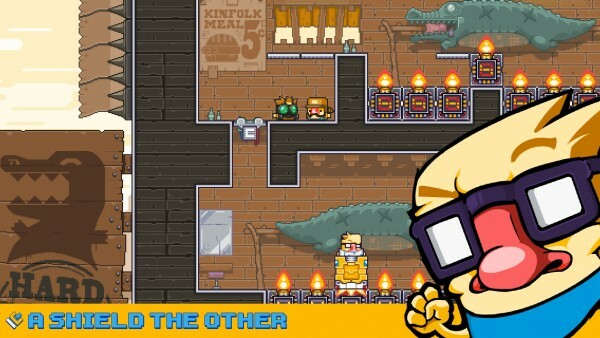 Some of my favorite games on iOS involve puzzles and platformers, even though I prefer physical controls for the latter. Despite that, I’ve been observing the mobile game industry for the past few years now, and I’m always surprised at what developers can come up with in terms of these two genres, or combinations of both. 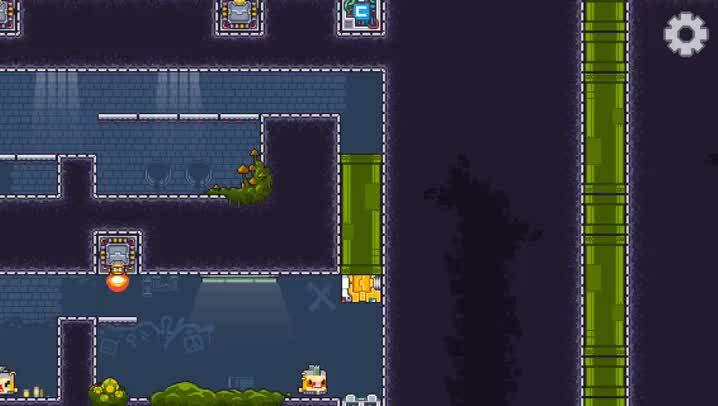 I’ve been a fan of Nitrome with their other games, so I was excited to hear about Gunbrick, because how can I resist some pixelated goodness? I’ve spent some time with the game now, and I can say that it’s a delightful title for any fan of the puzzle platformer genre. The graphics in Gunbrick are beautiful and harken back to the good old days of 16-bit gaming with a completely retro pixelated art style. And while it goes with that pixelated look, everything in the game is filled with copious amounts of detail, from the bright and colorful environments right down to the character sprites of enemies and the Gunbrick (and the duck who controls it) itself. This game takes me back to my youth, especially when I hear the awesome chiptune soundtrack in the background. Animations in the game are smooth, and the sound effects are quirky and fun. Gunbrick features over 30 levels spread out over three worlds of puzzling goodness for players to roll-and-shoot through. The game itself is fairly linear, as you unravel a story as you go and you cannot move on to the next level until you find the end point of the current stage. 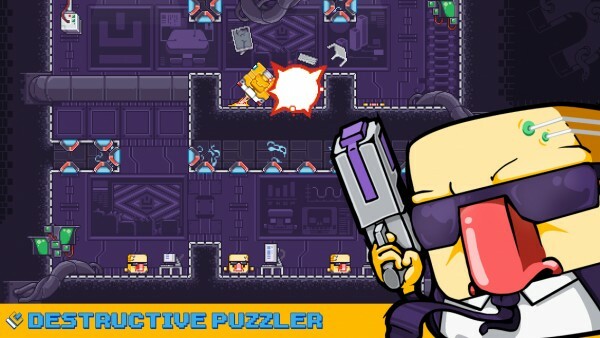 And even though 30 may not seem like a lot for the price, you’ll still spend a bit of time on this game because the difficulty level for the puzzles amps up as you progress. So what is Gunbrick? It’s a vehicle that replaces the obsolete car, and it has a gun on one side and a shield on the other — pretty nifty, right? 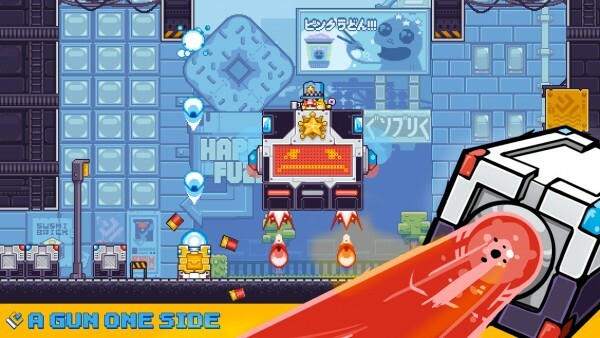 You’ll have to help the main character roll his Gunbrick to the charging ports at the end of each stage while avoiding dangerous hazards and crushing pesky foes. There are also boss battles that you’ll need to endure, but don’t worry — you have the Gunbrick, after all. The controls in the game are simple and intuitive. To move the Gunbrick, just swipe horizontally to roll the brick left or right. 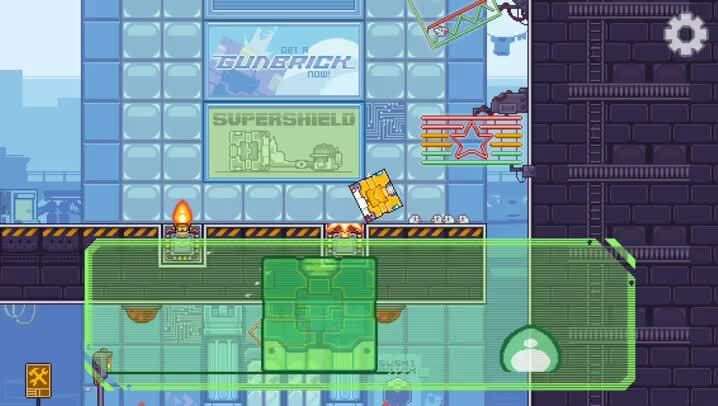 If you tap on the screen, the Gunbrick will shoot the gun, which is also used for propelling vertically or horizontally due to the recoil. When you encounter environmental hazards, such as fire, you’ll want to roll through them with the shield on the fire, otherwise the brick gets destroyed. While the controls work well for the most part, they do take some getting used to. Personally, I would have preferred some kind of button to continuously move, rather than keep swiping on the screen, as it would have been more streamlined. 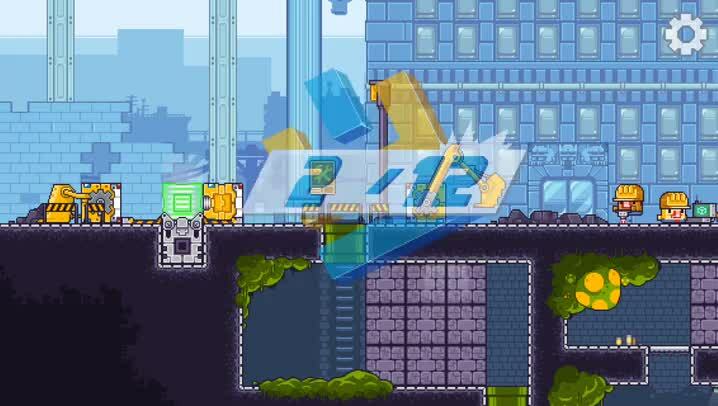 Since the game does not have timers or lives, you can play the levels at your own leisurely pace without having to worry about penalties for dying. Because of this, the game does not have Game Center support for leaderboards, but there are a good handful of achievements to obtain, if that’s your thing. I’m always a fan of these types of games, and Gunbrick is just the fix I need this week. The levels are cleverly designed, and you really have to think about the Gunbrick’s positioning when you’re trying to get past a gap or obstacle. Plus, the graphics are top notch, the chiptunes are awesome to listen to, and the controls work well. 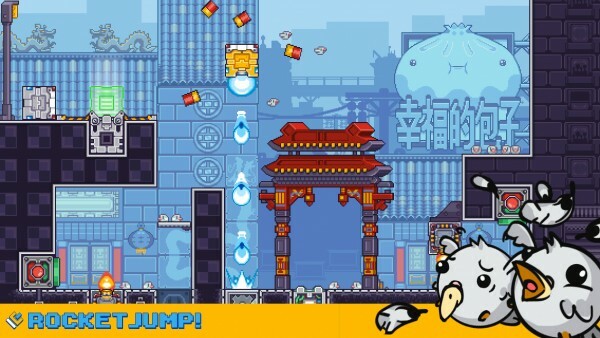 It’s a fresh new take on puzzle platformers, and enjoyable for fans of the genre. Gunbrick is available on the App Store as a universal download for $2.99.